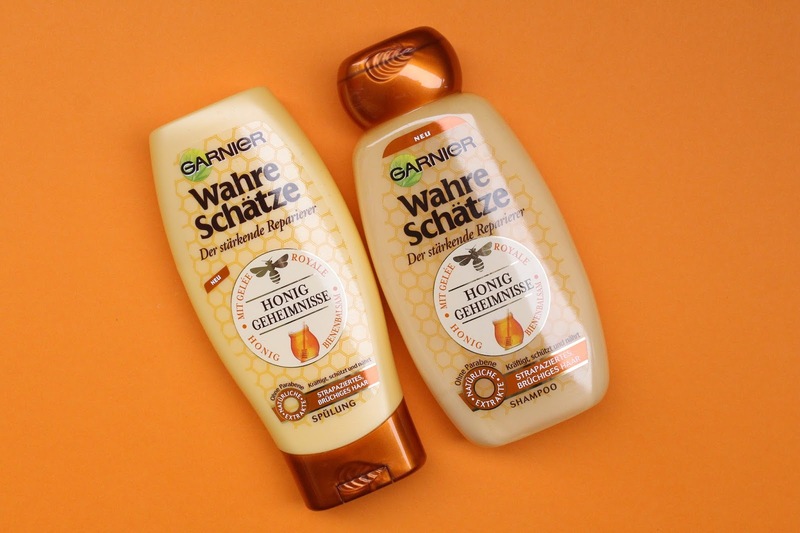 Durch die Garnier Blogger Academy durfte ich die neue Pflegeserie "Honig Geheimnisse" testen. Wie ihr schon wisst, habe ich sie mir ja sogar schon gekauft :D wie ihr in dem Beitrag hier sehen konntet. Die Pflegeserie soll das Beste aus dem Bienenstock sein und soll strapaziertes und brüchiges Haar reparieren und für Geschmeidigkeit und Kräftigung sorgen. 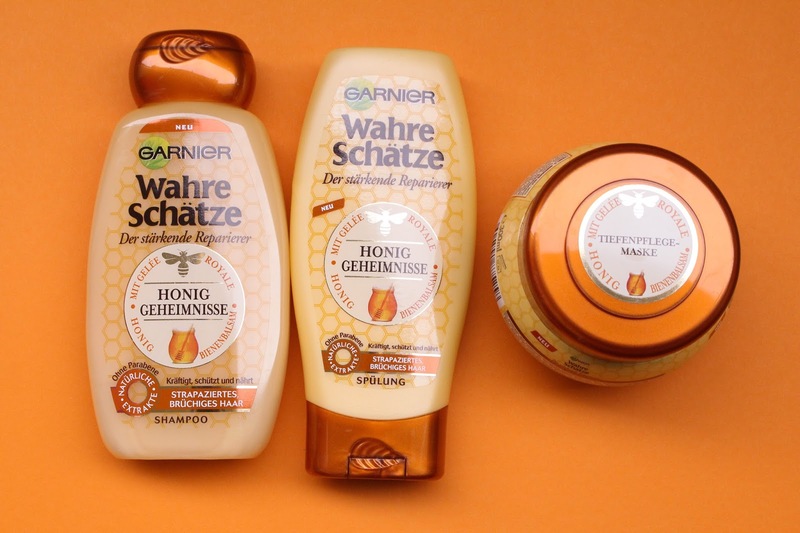 Through the Garnier Blogger Academy I got the chance to try the new product line "Honey Treasures". As you already know, I've even already bought it :D which you could see in this post here. The hair care line should be the best of the beehive and repairs damaged and brittle hair and provides suppleness and strengthening. The most valuable and revitalizing elixir royal jelly is a veritable nutrient concentrate and recognized for its ability to strengthen and regenerate the hair from the root. The bee balm, known in the jargon Propolis is a natural resin from the beehive and well known for its protective properties. It is produced by bees to protect debt for the hive and ensures even at the hair fiber for extra protection. Honey is rich in nutrients and vitamins, and known that it gives the hair carefree smoothness. Sanft in das feuchte Haar einmassieren und im gesamten Haar verteilen. Gut ausspülen. Gently massage into damp hair and distribute throughout the hair. Rinse well. Massage gently after every hair wash the conditioner to the tips. Leave it in for short and rinse. Die Tiefenpflege-Maske großzügig in die feuchten Haare einmassieren. 3-5 Minuten einwirken lassen und mit warmen Wasser gründlich ausspülen. 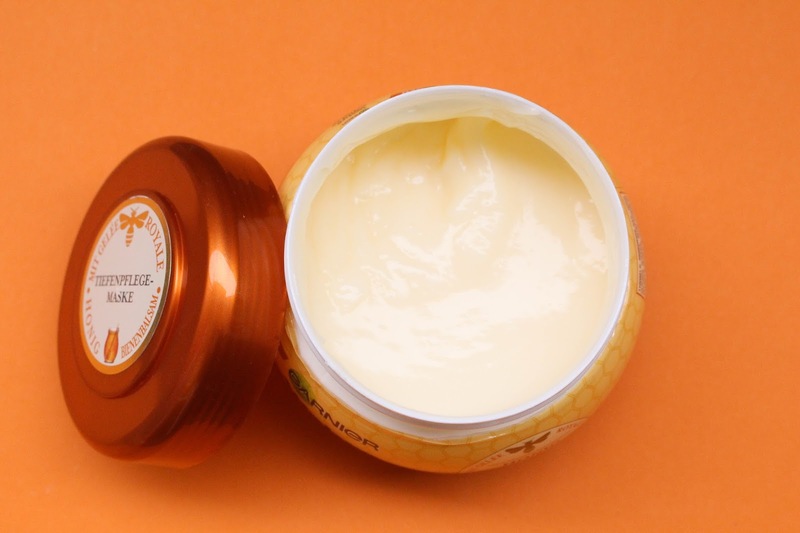 Massage the deep mask generously into damp hair. Leave it for 3-5 minutes and rinse thoroughly with warm water. Alle drei Haarprodukte riechen wunderschön. 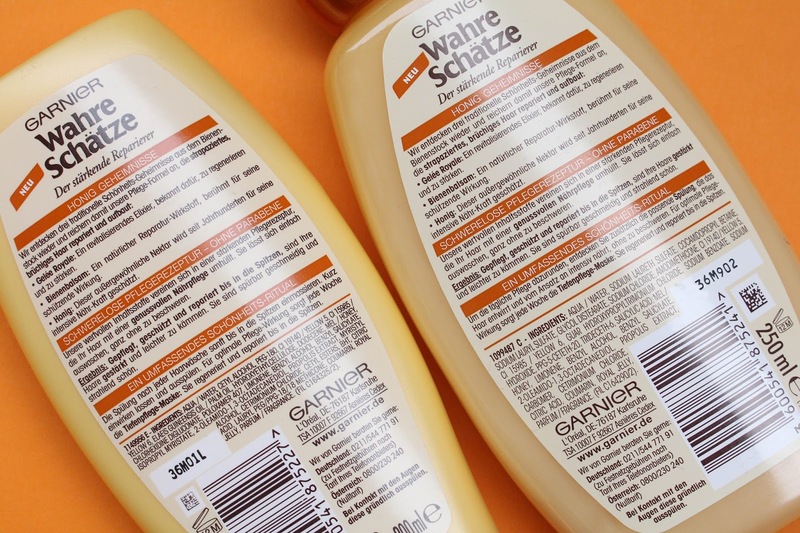 Das Shampoo und die Spülung machen die Haare nach dem waschen super kräftig. Immer wenn ich Haarpflege Produkte ausprobiere lasse ich meine Haare an der Luft trocknen um zu sehen wie die Pflegeeigenschaften so sind. Nachdem meine Haare trocken waren (nach Benutzung des Shampoo´s und der Spülung) waren meine Haare weder trocken noch geschmeidig aber sie haben schön geglänzt. Später als ich die Produkte zugeschickt bekam probierte ich noch die Kur aus. Die Kur macht die Haare total geschmeidig und die Haare sind auch richtig gut kämmbar. Schon beim ausspülen fühlten sie sich seidig an, selbst von Frizz war keine Spur! :) Wobei alle drei Produkte gut riechen, bleibt der Geruch nicht lange in den Haaren. 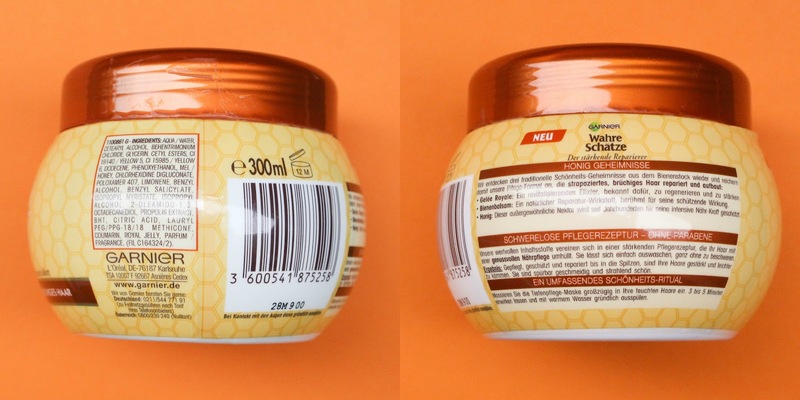 Die Kur hat mich zu 101% überzeugt und die werde ich sogar nachkaufen aber das Shampoo und die Spülung haben meine von Natur aus trockenen Haare nicht so ganz überzeugt. All three products smell beautiful. The shampoo and conditioner made my hair after washing super strong. Whenever I try out hair care products I let my hair air dry to see how the care properties are. After my hair was dry (after using the Shampoo's and Conditioner) my hair was neither dry nor smooth but shined beautifully. Later, when Garnier sent me the products I tried also the mask. The hair mask makes my hair totally smooth and the hair is really easy to comb. Even when I rinsed the mask out of my hair, my hair felt silky, there was even no trace of Frizz ! :) All three products smell good but the smell does not remain long in the hair. The hair mask has convinced me 101% and I'll even will buy it when it´s empty but the shampoo and the conditioner had not pleased my natural dry hair. Toller Post , die Produkte muss ich mal ausprobieren! awww die shampoos habe ich auch :) ich finde sie super, sie duften gut.